For the second year, King County Metro will offer free rides on New Year’s Eve. Rides will be free from 7 p.m. on Monday, Dec. 31, to 4 a.m. on Tuesday, Jan. 1, including DART and Access service. In addition, Metro will add buses to its night routes. The Seattle Streetcar also will be free on New Year’s Eve, and Sound Transit will extend the operating hours of Link light rail service between Angle Lake and the University of Washington. “Access to safe and reliable transportation is a cornerstone of Metro’s mission and New Years Eve is no exception. We hope existing and future riders will utilize Metro to help them celebrate the New Year this year,” said King County Councilmember Dave Upthegrove, who proposed the idea in 2017. King County Metro will operate reduced weekday schedules on New Year’s Eve on some routes, with extra buses on several routes serving destinations such as Seattle Center, Capitol Hill and downtown. New Year’s revelers can take advantage of Metro’s recently expanded Night Owl network, with added service on major routes between 1 a.m. and 5 a.m.
Sound Transit will operate extended Link light rail service with trains running until 2 a.m. pm New Year’s Eve. The last trains to leave Westlake Station depart at 2 a.m. The Seattle Streetcar will operate until 1 a.m.
Metro routes with added trips as needed will include 1, 3, 4, 5, 7, 8, 14, 24, 32, 36, 40, 41, 62, 65, 70, 101, 106, 120, 124, 150, 255, RapidRide A, B, C, D and E lines, and ST 550 and ST 554. The fareboxes and ORCA card readers on Metro buses will be covered to remind customers not to pay. A regular valid fare will be required on Sound Transit Express buses. 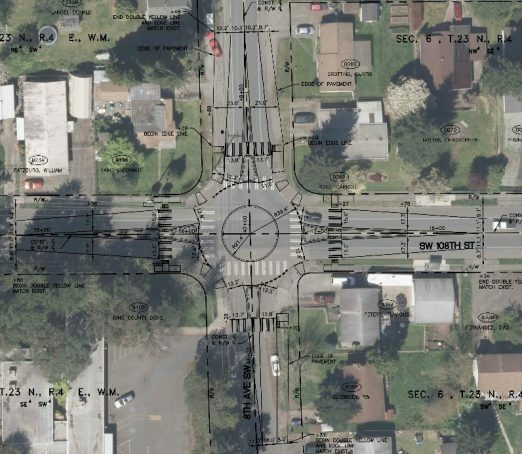 Design and construct a mini-roundabout at 8th Avenue SW and SW 108th Street, including a rectangular rapid flashing beacon at the west crosswalk, improvements to the sidewalks, ramps to be compliant with the Americans with Disabilities Act, and other safety improvements. This project will improve the safety of pedestrians and other users in the White Center community. The intersection was identified as a High Collision Location in King County’s report in 2016. The project aligns with the County Executive’s priorities of Equity and Social Justice, and Regional Mobility. The intersection is part of a designated “safe route to school” for four Highline schools, and connects to proposed project 1129600 RSD Highline School District Improvements. On-site observations by Road Services Division staff indicate that some drivers fail to yield the right-of-way to pedestrians — many of which are students. In addition, pedestrian ramps on all quadrants of the intersection are not compliant with the Americans with Disabilities Act. Metro and Seattle will share updates on the project, including the future route proposal and station locations, and seek feedback on RapidRide station amenities and improvements that make it easier for people to reach transit. The City of Seattle will also share its early design for a reimagined Delridge Way Southwest with bus lanes, landscaped medians, crosswalk improvements, protected bike lanes and neighborhood greenway connections, signal upgrades, paving, water and sewer pipe upgrades, spot parking and bike lane removal, and public art. In recent months, King County Metro partnered with the City of Burien to determine routing through their community, and also finalized the preferred route, planned stop locations, and pedestrian, lighting and RapidRide station improvements. This open house is a chance to learn about routing adjustments, the locations of consolidated and added stops, and safety and roadway improvements to be included in the project. The public also can help prioritize which RapidRide station amenities they would most like to see at each station. · Wednesday, Oct. 10, at Mount View Elementary in White Center (10811 12th Ave. SW, Seattle, WA 98146) from 5:30 – 7:30 p.m. Note: Child care is provided on site, and interpreter services in Spanish, Vietnamese, Khmer, Somali. · Online open house: Starting Oct. 10, to be available at Metro’s RapidRide H Line page. This website will be equipped with translations by selecting a language from a drop-down box in the top left corner. Upgrading route 120 achieves goals of the Metro Connects long-range plan and voter-approved Levy to Move Seattle. RapidRide H Line service is scheduled to launch service in fall 2021. Today, Metro Route 120 is tied for ninth-busiest bus route in King County and carries approximately 8,700 customers each weekday along the 13-mile corridor between Burien, White Center, Westwood Village, Delridge, and Downtown Seattle. The City of Seattle funds additional bus service on the route 120 thanks to the voter-approved Seattle Transportation Benefit District. To upgrade the route to RapidRide levels of speed, frequency and reliability, improvements are planned along the corridor that include transit priority treatments – such as bus lanes and more green lights for buses – and RapidRide amenities including unique stations, off-board ORCA fare payment kiosks, and real-time bus arrival information signs. Metro currently operates six RapidRide lines across King County with these amenities. 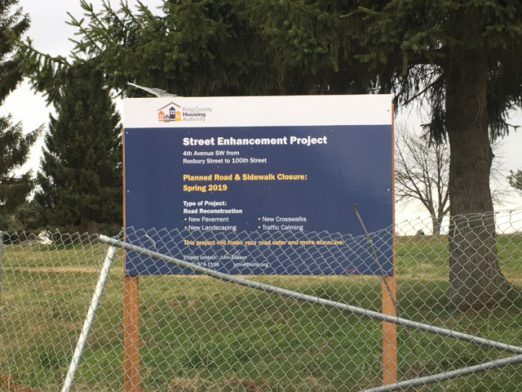 This project is funded by King County Metro, the voter-approved Levy to Move Seattle and additional grant funding, which has in part been secured and is also being sought by both Seattle and King County. 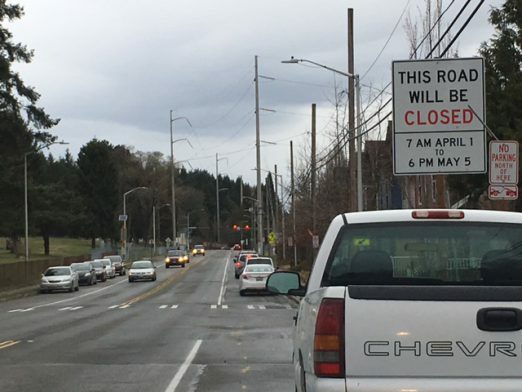 SDOT and the City of Seattle play a key role in supporting this effort by funding major upgrades to Delridge Way Southwest within the city limits. 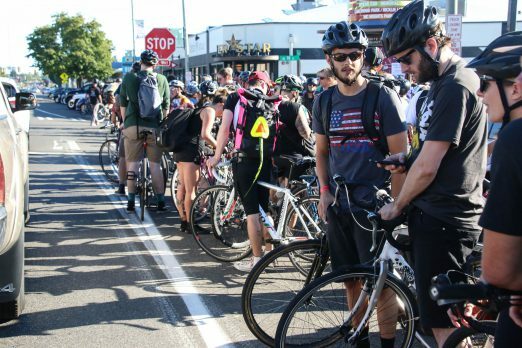 SDOT is designing new bus lanes to make Metro’s RapidRide transit investment more reliable, and adding bike lanes and neighborhood greenway connections, arterial crosswalks and signals, and walkways to get people between their homes, workplaces and RapidRide. In addition to proposing a new lane layout for public consideration, the City of Seattle’s investments plan includes basic infrastructure such as paving the northern part of the street, upgrading sections of old water and sewer pipes, and improving street lighting. The project will also invest in the Delridge neighborhood’s future and beautify the street by funding new public art and adding new landscaped median islands. West Seattle residents and business owners will see these investments in their neighborhood thanks to Seattle voters, who partially funded this project with the nine-year Levy to Move Seattle. For a little while on Saturday evening, bicycle traffic took over northbound traffic on 16th SW in downtown White Center. 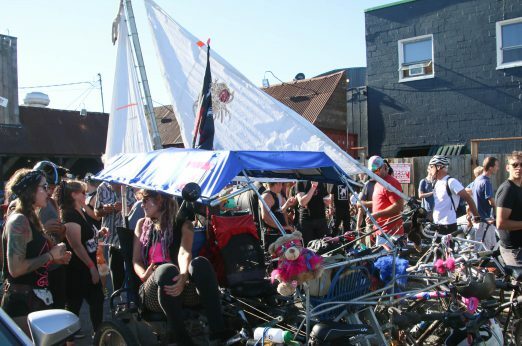 The occasion – the Dead Baby Bikes Downhill, maybe the wildest ride in the metro area every year. 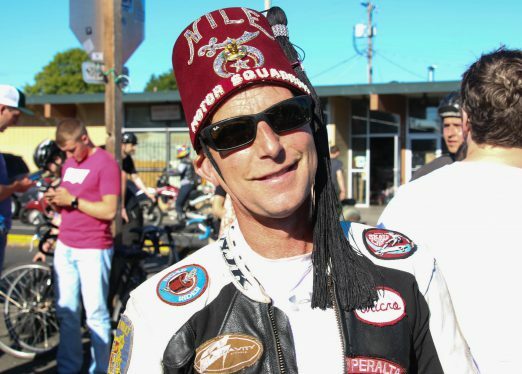 Riders gathered at Drunky’s Two Shoes BBQ before taking off. 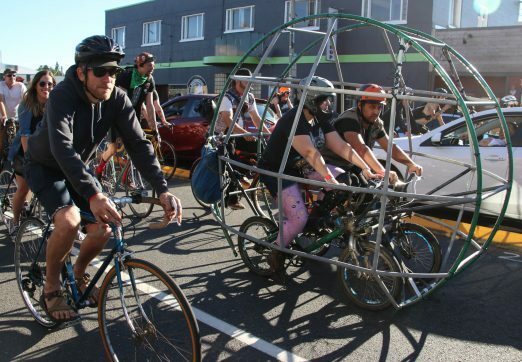 It’s a party on wheels as well as a spectacle. That’s Mike Shaughnessy from West Seattle. The riders numbered in the hundreds – we lost count – and headed for Georgetown. 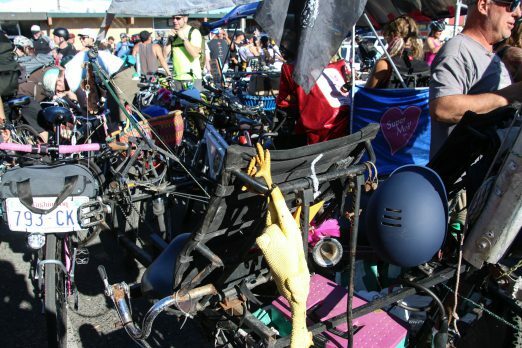 The irreverent-to-say-the-least Dead Baby Bikes Downhill bike ride (or is it a race?) is starting from White Center this year – Drunky’s Two Shoes BBQ at 98th/16th, to be specific. 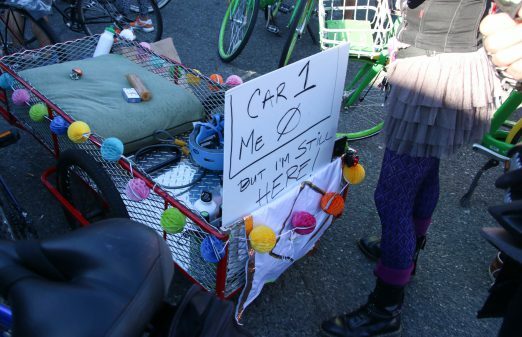 So if you see an eclectic group of bicyclists gathering prior to the start time (6 pm) on Saturday, that’s what’s up. While it’s not on the official page, we’re told they’ll be heading for Georgetown. About the name … backstory here. Metro’s new fare of $2.75 aims to help customers by making riding transit more convenient and reducing confusion over fare payment that leads to delays in boarding. A single fare for adult riders also lowers the potential for fare disputes, which will help improve safety. Starting June 1, customers can purchase ORCA passes for July under the new fare structure. Metro’s fares for youth, seniors and disabled riders, and those enrolled in ORCA LIFT will not change. More information can be found on Metro’s fares page. Metro adopted a simple fare after receiving more than 11,000 responses to two public surveys, including one in which 80 percent expressed support for a flat fare. Metro previously had one of the nation’s most complex fare structures, with one zone for the City of Seattle and another for all areas outside of the city, as well as extra charges during the morning and evening commute. About 65 percent of Metro boardings will see no change or pay 50 cents less under the new structure. Fares for off-peak travel will increase by 25 cents – affecting about 35 percent of Metro boardings. Customers who qualify for reduced transit fares now have new ways to apply for a discount ORCA LIFT card. Metro and Public Health – Seattle & King County launched a new partnership with the state Department of Social and Health Services to distribute ORCA LIFT cards to clients in need of transportation assistance. The DSHS Community Service Offices with ORCA LIFT enrollment include five locations in Seattle, and others in Renton, Auburn, Federal Way and Kent. More than 4,200 have enrolled through DSHS since the partnership began. ORCA LIFT allows riders with lower-incomes to pay a reduced $1.50 fare. More than 64,000 people have been enrolled in the program since it launched in 2015, with more than 14 million boardings on Metro. ORCA LIFT is available at over 125 locations through Metro’s partnership with Public Health – Seattle & King County and local community-based organizations. Metro also is working with ORCA agency partners to reduce the replacement card fee for ORCA LIFT customers from $5 to $3 and eliminate the $3 initial card fee for seniors and people with disabilities. At the beginning of 2018, Metro increased funding for Human Service tickets for riders with lower-income or no income. Road alert from King County – drainage work will close 26th SW/SW 112th starting Monday morning and continuing until Friday afternoon. We will keep an eye on it in case it reopens early, of course. It is vital to thoroughly assess any routes as Metro plans for service. 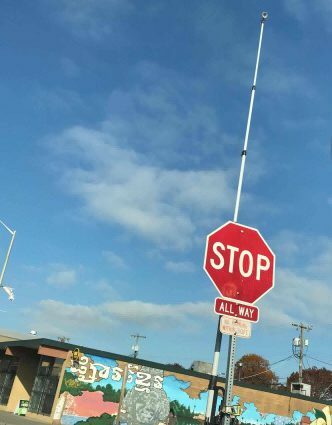 Street cameras in the vicinity of 98th and 16th in White Center are there to assess traffic data for the upcoming expansion of the Rapid Ride H Line. King County Metro will alert the public to participate in surveys on the new line, most likely by mid-November. We should get word of that survey sometime after Veterans Day. Meantime, KCDOT explains that the cameras are being used “for a variety of assessments: Speed and reliability, difficult turns, traffic flow, etc.” The H Line conversion is currently expected to happen in 2020. The restriping work is scheduled to last 3-5 days, from 7 a.m. to 6 p.m. All lanes of traffic will be open from 6 a.m. to 8 a.m., and from 4 p.m. to 6 p.m. At other times, at least one lane will remain open with flaggers directing traffic. No parking will be allowed along this part of the road during the project. If you live/work near that stretch, you’ve probably already seen this flyer (or a similar door-hanger card) as part of the county’s outreach work. King County Roads has issued an alert for four blocks of SW 107th next Saturday night, in the White Center/North Shorewood area – it’ll be closed between 22nd and 26th SW because “epoxy and anti-skid material (High Friction Surface Treatment) will be applied to increase traction for vehicles. Data shows that this treatment helps dramatically decrease the numbers of crashes.” It’s one of 23 areas around the county where this is being done this summer. It means the road will be fully closed for several hours at a time between 6 pm and 6 am Saturday, August 12th, and: “During this time, there will be no access to driveways and side streets within the project limits.” More here. Just announced by King County Road Services, a closure of one block of SW 104th, from 15th to 16th, starting next Monday, July 24th. “Crews will be replacing a deep, deteriorated underground drainage system,” says the alert. The work is expected to be done by August 11th. A new start date for the Roxbury sidewalk-building project between 28th and 30th SW – July 10th. That’s the latest from King County Roads. The work will close a lane on the south side of SW Roxbury – eastbound – on weekdays, as there will be concrete replacement work on the road as well as sidewalk construction in the area where the walkway is now just painted. The work is expected to take less than two months. Construction season is in full swing and in Burien, a project to repave northbound State Route 509 will soon join the mix. Contractor crews working for the Washington State Department of Transportation will repave more than 3.5 miles of the highway between South 168th and South 112th streets to create a smoother driving surface. They will also repair and replace portions of guardrail. The $4.6 million project begins Sunday, June 4. 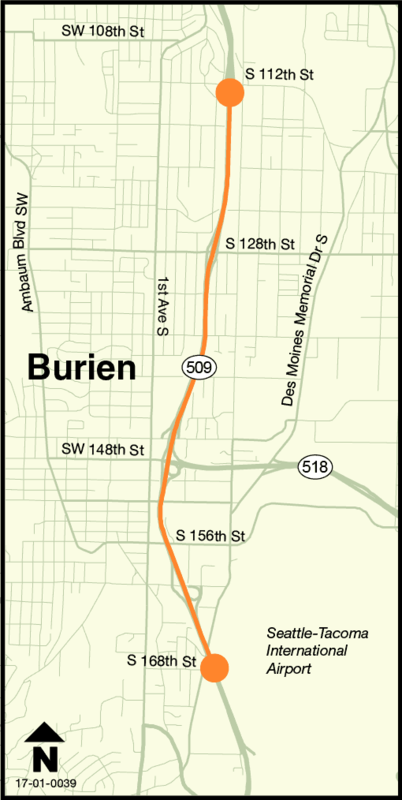 Also known as the Burien Freeway, this section of northbound SR 509 is cracked and rutted from years of vehicle traffic. Approximately 28,000 vehicles use this section of roadway each day, which was last repaved in the mid-1990s. · Drivers should expect single lane, ramp and shoulder closures on northbound SR 509 during daytime and nighttime hours for paving work. · Crews will need to close the left lane of northbound and southbound SR 509 for a total of three weekends and occasional weeknights to repair and replace the guardrail in the median. · For more information on scheduled lane reductions and detours, visit the King County construction page. WSDOT contractor, Tucci & Sons, Inc., expects work on the $4.6 million project to wrap up in fall 2017. · Businesses along this section of SW Roxbury Street will remain open and access provided at all times. Access points will be provided for the gas station, the auto parts store/latte stand and auto repair shop. 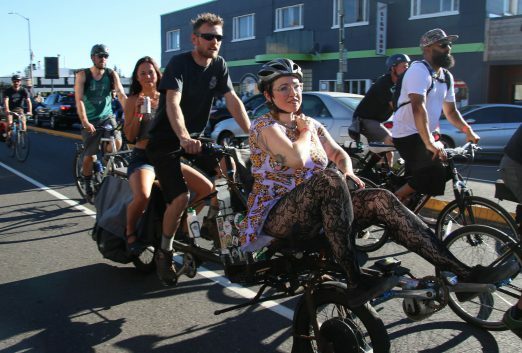 July 26th, 2016 Tracy Posted in Food, How to Help, Transportation, White Center news Comments Off on Spoke & Food: Bicycle to participant Proletariat Pizza tonight! 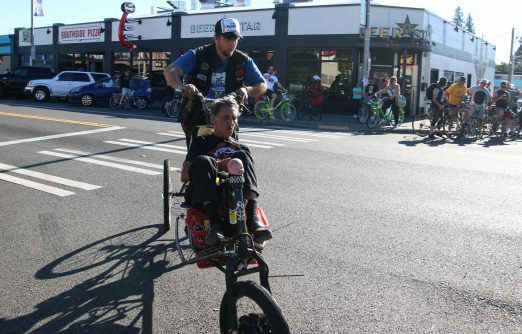 The annual Spoke & Food bicycle-to-dinner benefit is tonight – and Proletariat Pizza in White Center (9622 16th SW) is participating. 5-9 pm, Proletariat and other participants around the region are donating 20 percent of their proceeds; this year, the beneficiary is the Hunger Intervention Project. The first 20 bike riders at each Spoke & Food location get backpacks! It’s “Bike Everywhere Day” – formerly “Bike to Work Day” – and if you’re biking, you have a “celebration station” to visit in White Center: Dubsea Coffee in Greenbridge, SW 99th/8th SW. It’s co-sponsored by the YES! Foundation and the Major Taylor Bike Club, and bicycle riders are invited to stop for free coffee, bananas, treats, bike checkups, and info about bicycling in WC. 6 am-9 am.